Whether your long hair expresses your love for a certain genre of music or freedom from social binds, you have to get rid of it for college or at least tame it down. A good hair gel will help you get the task done easily. Whatever the occasion and whatever be your hair type, Set Wet's range of Alchohol-Free hair gels lets you get creative with your hair with any of its 5 variants: Cool Hold, Vertical Hold and Wet Look, Casual Hold, and Ultimate Hold. Set Wet Gel Wet Hold gives your hair a perfectly shiny, silky, glossy look that stays all day long. This Set Wet hair gel?is your perfect partner when it comes to grooming your hair to suit a particular trend and situation. Grab the opportunity to retain your long hair or at least a hairstyle that you are fond of. This hair styling gel is composed to suit the difficult hair of a man and soothe its texture so you can?achieve any hairstyle?you want to sport. The ingredients of the gel form a clear film between each hair strand which helps in binding them together and shaping the hair as desired. Explore the entire range of Gels & Waxes available on Nykaa. 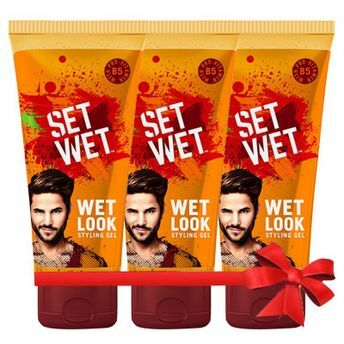 Shop more Set Wet products here.You can browse through the complete world of Set Wet Gels & Waxes .